Looking for a family vacation or couples retreat off the beaten path? Consider a yacht charter vacation in the Exumas, Bahamas. Situated on the southern end of the Bahamas chain and scattered along a stretch of 100 miles, the Exumas offers easy access from the US as well as a unique vacation experience. 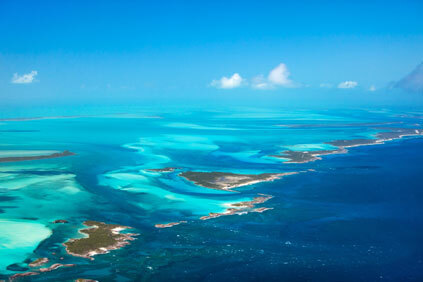 As described by one of our Bahamas based crews, "The Exumas are remote, pristine, varied and exotic. The vibrant shades of blue waters are awe inspiring and the Exumas is truly a unique and special place to visit!" When to Charter in the Bahamas? A few of our favorite BVI based yachts and crews will typically head to the Exumas during the late Spring and early Summer months as this is the ideal time to go vacation yachting in the Bahamas. A handful of other recommended and higher end motor yachts base in the area year round. The Cost to Charter in the Bahamas? As charters in the Bahamas are typically plus all expenses of 30% to 35% on top of the rate plus 4% Bahamas tax, charters in the Bahamas typically start around $30,000 to $50,000 and in general, are more expensive than comparable yachts offering all-inclusive BVI charters. Learn more about these key picks below or contact us today regarding your interest in our Bahama Catamaran charters. Why Charter A Crewed Yacht In the Bahamas? Pristine Charter Destination: The Exumas are remote and unspoiled. Her tranquil waters are ideal for water sports such as stand-up paddle-boarding, jet skiing, or kayaking and offer the opportunity for amazingly fresh and tasty local cuisine. Unique Snorkeling: The Bahamas offers crystal clear water, colorful reefs, and a bounty of underwater life. Unusual snorkel spots are found in grottos and underwater caves, the most famous being the Thunderball Grotto on Staniel Cay. Easy Access from the US: The popular and accessible island of Nassau makes for an easy start and end point for your charter with easy flights to and from the States. Our cruise on the Xenia 62 was absolutely fabulous!! I also want to commend you for your work in helping us select this boat and crew. They were a wonderful fit for our family and delivered everything you promised. Thank you. We will return! Consider one of our popular BVI Yacht Charters or a charter in and around St. Maarten, each offering a slightly different flair. Learn more about our destination options. Enjoy a crewed charter while vacation yachting in the Bahamas aboard one of our popular catamarans, monohull sailboats and luxury motor yachts. Learn more about our various yacht styles.